Virginia Limousine Association Presenting The Tide Water Tinsel Tour offers a bit of festive fun! Take a ride with us through various neighborhoods in the surrounding areas of Virginia Beach, VA and marvel at the stunning visual display of Christmas lights! Our professional chauffeurs are courteous and hold your safety in the highest regards when going from place to place. With our quality fleet of stretch and Hummer limousines, we are at your service with first class transportation accommodations to all of your events or special occasions. 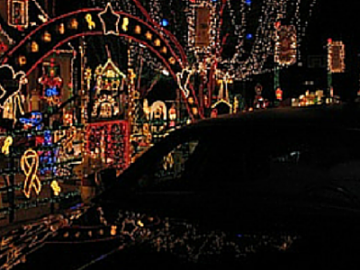 Virginia Limousine Association Presenting The Tide Water Tinsel Tour was originally inspired by by Richmond's Tacky Light Tour; a fun venture where buses and limos escorted guests to view Christmas lights in the surrounding neighborhoods. To create a new tour, a few local members of the Virginia Limousine Association teamed up to offer a Hampton Roads tour. They made an effort to discover compelling streets and homes that go above and beyond in the holiday cheer department with beautiful lights and Christmas displays. Interestingly enough, this location originated as British colony where American Christmas traditions started in the 17th Century. So this has been a long standing tradition rich in history! Many displays include 60-foot pine trees completely lighting up the night sky along with colorful archways and cheerful props that will leave you in awe! So far, Virginia Limousine Association Presenting The Tide Water Tinsel Tour stops at several houses and commercial sites in Virginia Beach, including Holiday Lights at the Beach, the drive-through display on the Boardwalk; 43rd Street at the Oceanfront; Wimbledon on the Bay off Great Neck Road; Lakeview Park; Founders Inn; and Brigadoon. We offer a variety of vehicle types including sedans, SUVs, limousines abd more available for the tours! You can even bring along snacks and drinks like hot chocolate which is perfect for a chilly night!